Despite their constant spats, the two somehow fool everyone with their false relationship. 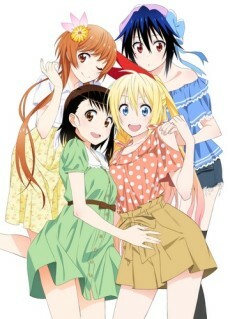 Raku then discovers that Chitoge has a mysterious key from her past, which she can't remember... Plus, two other girls appear with keys as well—Kosaki Onodera and Marika Tachibana! Caught in the midst of this love maelstrom, even more complications arise for Raku when his class decides on Romeo and Juliet as the class's play for the school festival. Can the two false lovebirds pull off the impossible and make the play a success? For us in the sidelines, witnessing the daily life of false love is a hilarity. Heart beat rises, blushes reddening.